Well, we have been officially training for 3 months now and the Tower of Terror 10 miler is 114 days away. Last week, Jeff Galloway's training program officially began for this event. Since we have been using a variety of iPhone apps to train, I decided to go ahead and get Jeff's app (the 5k trainer was free on Memorial Day weekend) and manually change it to the 4 min on 1 min off program. It matches up to his official Tower of Terror 10 miler 18 week training course. So with that said, I had no idea how difficult it would be to change programs. Up until I started Jeff's technique, I was running longer distances with longer walks (the last one prior to switching was 20 min on, 5 off, 10 on, 3 off, 5 on, 5 cool down). I am not sure if it is the FL heat, or the switch up in training, but my last 4 runs have been VERY rough. I am getting hints of shin splints (haven't had those since High School). I am tired. I am cranky. I hate the heat. Most of all, I am starting to get discouraged. I hate that D word, it is nasty. For instance: yesterday, we finished week two day 1 of the 18 week program. It was a 2.5 mile day and our time was 31:18. We started off with a 3 min warm up walk, then 4 - 4/1 ratios, ending with a 3 min walk. Our final time was 31:18, giving us a 12.6 minute mile. 2 weeks ago, we ran 3.89 miles and finished in 39:45, giving us a 10:11 min mile. Did we do the right thing switching up programs? I have to trust Mr. Olympic master of Endurance but it is really difficult to move down than move up. I keep telling myself it isn't about the time, it is about finishing in one piece, but my competitive spirit finds this very hard. I'm going to get off my soap box now. 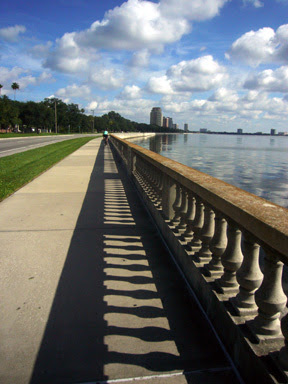 My BFF Is coming to visit this weekend and Saturday, we will run 4 miles along Beautiful Bayshore. Hopefully this view will brighten up my run.